This course will prepare participants to utilize the Animal Emergency Response Resource Typing and Credentialing templates, and position task books to manage an animal-related disaster response and recovery at the local, state and regional level. This course will support the development of collaborative resource sharing plans and agreements to effectively manage an animal-related disaster response and recovery within a community and/ or region. Participants will be able to choose from four exercises at a course delivery: animal disease outbreak, earthquake, wild fire, and storms/flooding. This course will describe the establishment and management of a credentialing system for animal emergency responders including utilizing position descriptions, task books, and the Resource Ordering and Status System. Participants will learn the key components and benefits of a credentialing system, an overview of the national credentialing standards for AERs, how to conduct a gap analysis, how to order needed people, and resources using common terminology. 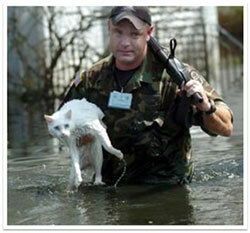 Personnel with mid-to upper-level planning and resource management responsibility for the response to an animal-related disaster, including emergency managers, law enforcement, firefighters, EMS, Search and Rescue, veterinarians, extension, public health, academia, animal control, non-governmental organizations [e.g. State Animal Response Team, Red Cross, Voluntary Organizations Active in Disaster (VOAD), and Salvation Army], tribal nations and military involved in disaster response, and federal, state, and local agencies and elected officials. Currently, this course is not scheduled. If you are interested in scheduling this course, please contact us at cafsp@utk.edu. Participants are recommended to complete the web-based course entitled “Utilization of National Credentialing Standards for Animal Emergency Responders: An Introduction”.